This is an updated and revised document that differs from the original. I’ve retained the original text, which is presented with a line through it. I was a little harsh with my first post and am seeking to set the record straight. It’s not for me to say what others should make of their archaeological discoveries. I should just listen and synthesize human history accordingly. Trouble is…when I do, it makes no sense and it really hurts my brain! Regardless of which you read, or even if you read the peer-reviewed article, you’ll be treated to a confused account of what I guess is someone’s conflation of some true facts. 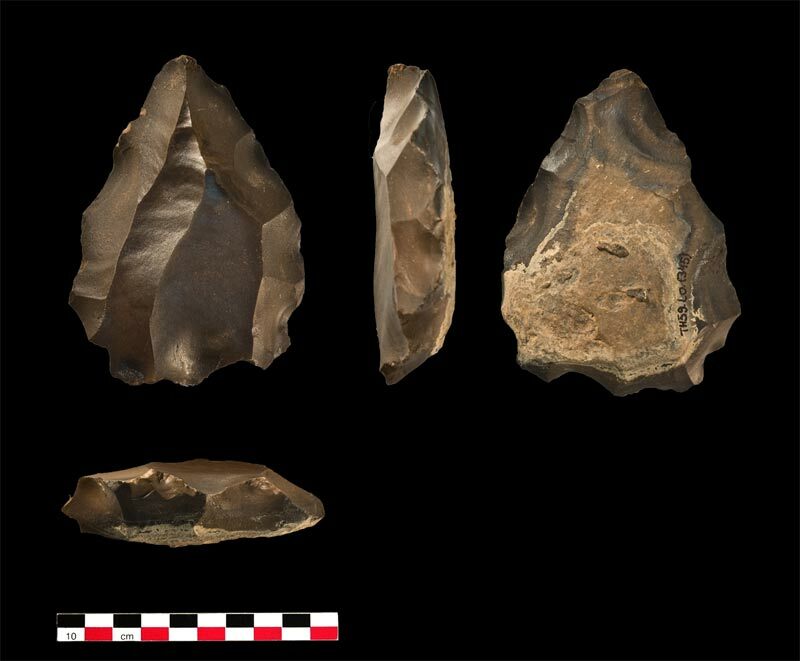 Both media outlets and the article reproduce the following (intensely beautiful) image of a flint artifact from Oman that is said to be more than 100K years old. I can easily believe that. However, I have trouble with the assertion that this discovery is the oldest occurrence of this stone industry outside of Africa. This creamy, lustrous object is a Bordesian dream: it’s the second of the two Levallois Point cores that François Bordes named in 1980. You remember, it’s the one with two final flake removals, both triangular (and both, according to the pundits, conceived ahead of time and carefully prepared for by wasting dozens of useful flakes). [Somebody please tell me to stop!] The authors presumably think they can get away with this tripe hair-splitting, since this artifact is typical of an assemblage type referred to among northeastern African archaeologists as the ‘Nubian Complex,’ and not just the Nubian Complex, this artifact is part of what’s termed the Nubian Type 2. Thus, despite it being just another Levallois artifact, the scholars aver that their discovery represents the first occurrence of this type outside of Africa! In truth, there’s nothing unique about the existence of this kind of artifact outside of Africa! As you all now know, the Levallois technique (or rather the fanciful archaeological construct of the same name), occurs in southwestern Asia (of which, you’ll recall, the Arabian Peninsula is part) and across Europe. It’s everywhere. And it’s been there for at least 150K years…more like 250K. So, this object rewrites no story. The authors allow that the Levallois exists elsewhere on the margins of Africa. But they’re also careful to point out that their discovery is the first in Arabia along the ‘southern route’ out of Africa. So, theirs is the oldest! It’s the archaeologists who’re rewriting the story, and I have to ask why. These discoveries are just what any anthropologist would have expected given the age of the site. And it’s not the first time the Levallois technique has been described from the Arabian Peninsula. So why make a big deal out of it? And why stand by while the media hype this as demanding a rewriting of the ‘Out of Africa’ hypothesis? Strategic silence is just that. A claim like this, for the oldest anything outside of anywhere, will garner you at least 50K more on your next grant proposal, and it might even get you tenure if you play your cards right. Good on you, Jeffrey Rose and Anthony Marks. Good on you, Plos One for accelerating publication of this level of disingenuity archaeological marketing. This paper belongs in a regional archaeology publication, not on the world stage. Give me a break! No. Gimme a strong drink! ← Out of Arabia? The Levallois Technique in Oman. No Biggy. Right? Marks and Rose Claim Otherwise. Why?